Relative Strength Index was developed by J.Welles Wilder Jr. and first introduced in his book 'New Concepts In Technical Trading Systems'.It is one of the most popular technical tools around and is plotted on a vertical scale of 0 to 100.The 70% and 30% levels are used as warning signals. A relative strength index above 70% is considered overbought and below 30% is considered oversold. When trading the stock markets "buy" signals on the RSI are considered to be readings of 30 or less (the security is considered oversold) and "sell" signals are considered to be RSI values of 70 or greater (the security is considered overbought). Depending on the technician and price volatility, there are various other qualifiers and nuances that can be incorporated into a signal. An RSI above 70% is considered overbought and below 30% is considered oversold. Relative Strength Index (RSI) measures the strength of all upward movement against the strength of all downward movement in a specified time frame. The most common parameter for RSI is period 14, although users can pick their favorite period of time if they wish. It is one of the most popular oscillators that works well in range-bound market. These are indicated when the readings go above 70 (top) and below 30 (bottom). RSI can form formations similar to Chart Formations. The RSI may form chart formations that may or may not appear on the actual bar chart e.g. you might see a head and shoulders formation on the RSI but not on the bar chart. When the RSI goes above 70 or below 30 this is a strong indication that the market is ready for a reversal. It is sometimes more apparent that support or resistance is forming in the RSI than can be seen on the bar chart. 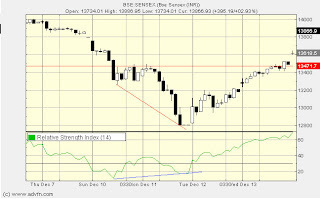 Use of RSI is that of divergence as suggested by Wilder himself.. When the security you are trading makes a new high and the RSI turns down that is bearish divergence. We also prefer to see divergence at major tops and bottoms. That is to say, if we have been in a down trend for some time as shown in the chart above and price has gone past a reading of 20 on the RSI AND we see divergence then we are a lot more confident that price has in fact bottomed. We don't like to use RSI as a sole trigger for a new position but rather like to use it in combination with other indicators to help build a picture. You will notice that in most cases of divergence the security makes a low as does the RSI, then the RSI begins to turn up but the security continues down. We wait for the security to make a new low and the RSI to come down but not as low as the previous low and that is the point where action can be taken. The fact that the RSI has not dropped lower than its previous low and the price has, is the point of recognition. * The RSI is a momentum indicator, or oscillator, that measures the relative internal strength of a market (not against another market or index). * As with all oscillators, RSI can provide early warning signals but should be used in conjunction with other indicators. * Divergences are the most important signal provided by RSI. I am Richa from SiliconIndia, I trust my email finds you in good health and high spirits. I am also an avid blogger and thought it’s a good time to initiate an interaction by updating you on some of the recent happenings at SiliconIndia. We have leaders like Narayan Murthy, Azim Premji to fresh graduates who share their opinion & thoughts to contribute their knowledge and advice through blogging. We would love to see you, embark on blogging here and sharing your perspectives to the rapidly growing SiliconIndia community and appreciate your community initiative here. Please mail me back at richa@siliconindia.com with your suggestions and feedback.